First off, I have never been a festival person. Not in the big, outdoor tens of thousands of punters sense, anyways. I’ve been to my share, yes, but except for seeing Richard Thompson at Bluesfest three years ago (and that was only for him), the last time I did the sit-around-all-day-and-burn thing was seeing Neil Young and Oasis at Molson Park fully ten years ago. A decade! But generally I just can’t be bothered to deal with the crowds, heat stroke, port-o-lets, travel, poor sound, etc etc so I don’t go. And yet, here I am in Chicago for this year’s edition of Lollapalooza. What can I say, the press pass was pretty damned enticing and between you and me, getting out of town for a few days is something I probably needed. Even if it is for “work”, of a sort. I actually intended to go to my first Lollapalooza a couple years ago but it got axed, as most are well aware. I still have my ticket, soaked with tears, but considering that the bands that I had wanted to see on that tour are all pretty much on this year’s bill, we’ll call it justice. But yes, festivals – it’s been a long time and frankly I have no idea what to expect. The closest I’ve gotten to something of this scale has been SxSW the last couple years, and even that’s nowhere near the same thing. Besides the fact that it’s spread out all over downtown Austin in a million and one little clubs, Sx is about the new bands – catching the buzz, discovering the talent, and so forth. If almost any of the bands playing Lollapalooza were to make a SxSW appearance, it’d be huge news. Hell, The Flaming Lips’ shows this past March were all anyone could talk about and yet, here, they’re not even a headliner – just the 6:30-7:30 Saturday night slot on the Bud Light stage (okay, maybe not *just*, but you get my point). Like Wilco, or Sonic Youth or The Shins. No, the headliners are the likes of Kanye West and The Red Hot Chili Peppers. You know, bands that sell records. But this should, at the very very least, be entertaining, exhausting and interesting. The lineup is star-studded but not overwhelming – I have a pretty good idea of who I’m going to see and there’s only a few tough choices to make (Broken Social Scene or Blues Traveler – what to do, what to do). I have a photo pass as well so I’ll be fighting for space in the photo pit to get a shot up Ben Gibbard’s nostril. But mostly I’ll be soaking in the festival experience and perhaps discovering that I’ve been missing out on a great time… or not. For those of you playing along at home, Billboard has set up a Lolla minisite where they’ll have, um, stuff, and AT&T’s Blue Room will be webcasting a slew of performances live over the internets. The schedule is as follows – note that these are Chicago times, as in Central Daylight Time. The Associated Press has a piece on how Lollapalooza has changed over the years. I was too young to catch the really good lineups in the early 90s. By the time I was of concert-going age, it was all Metallica and stuff. Yeah. And Spin lists off 10 lesser-known bands playing the fest that they recommend. And Chicagoist also wants to tell you who to see. And because I know you all get twitchy when there’s no audio content in a post, I leave you with a gift. A low-bitrate, mono gift, but still somehow nice-sounding. Enjoy. Some non-apalooza ites from the utterly bizarre – Johnny Marr has joined Modest Mouse – to the utterly crappy – Arthur Lee of Love has died. Pitchfork reviews the Luna covers compilation Lunafied. They like it. As they should. And some shows- The Grates, aka band of the week here, are indeed coming back to town for a third time this year and again, they’re opening. They will support Rogue Wave at Lee’s Palace on September 9 ($12). Islands are at the Opera House on September 28 ($13), Polaris Music Prize nominees Malajube are at the Drake on September 28 (though they might be Polaris Music Prize winners by then), and Scissor Sisters are at the Kool Haus on October 10 ($25). yep – went to the first Lolla with Living Colour, Siouxie, Nine Inch Nails, Jane’s Addition, Ice T – even thought it was at the Ex Stadium it was splendid indeed. 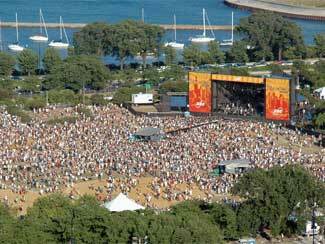 However different, my next Lolla was Hole, Beck, Pavement, Elastica, Cypress Hill et all. Molson Park. Happy happy fun. Look forward to reading your posts from this one! as much as i like intimate venues and meeting the bands after etc., i really love festivals. so much fun. I went to the one that had Arrested Development and Rage Against the Machine in the lineup (early 90s). As one of the "senior" members in the crowd the shows kicked ***. I especially liked "The Flaming Lips." They really get the whole experience.